"In violently resisting unjust violence, one finds oneself ethically obliged to do the wrong thing. This is a difficult position to sustain." What does it mean that violence could be “justified”? What does such justification signify, and what does it accomplish? What underlies its conditions and limitations? Perhaps most importantly, is there any way to resist injustice effectively without feeding a cycle of violence? Love & Arms investigates the paradoxes of just war from the standpoint of a Canadian woman who was involved in the most violent era of South Africa’s armed struggle against apartheid. Helen Douglas bases her analysis on a close reading of the philosopher Emmanuel Levinas, for whom everything human begins from our unconditional responsibility for the suffering of others. 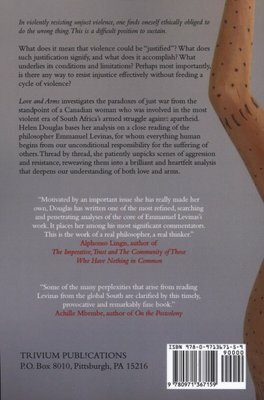 Thread by thread, she patiently unpicks scenes of aggression and resistance, re-weaving them into a brilliant and heartfelt analysis that deepens our understanding of both love and arms. "Some of the many perplexities that arise from reading Levinas from the global South are clarified by this timely, provocative and remarkably fine book." -- Achille Mbembe, author of On the Postcolony. 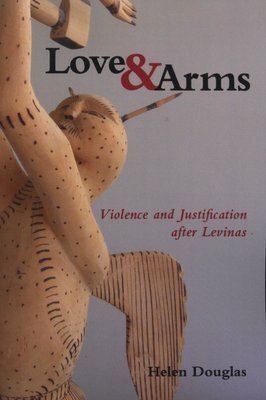 "Those who seek an entry point to the work of Levinas will be richly rewarded... Love & Arms exhibits a combination of analytical rigour, compassion and frequently poetic commitment - a rare achievement." - Mail & Guardian.